Gremlins are hands-down the most mischievous ReAction line yet! who come in a variety of packs featuring tons of accessories! Gizmo is paired with Barney the family dog, a trumpet, and candy cane! Christmas Gizmo comes wearing a Santa hat and a keyboard! Mogwai Stripe comes with a computer while Gremlin Stripe bears a chainsaw! Not to mention the gun-brandishing Bandit Gremlin and Cinema Gremlin with movie popcorn! the ReAction world as part of our Scarface series. to enact some vengeance, petty or not! We’re going to need a bigger box! professional shark hunter Quint, and Matt Hooper, a marine biologist. You’ll also find a super-sized Great White Shark figure, too! The first rule of Fight Club ReAction is that they’re completely awesome! his lover, Marla Singer, as well as the incongruous Narrator. 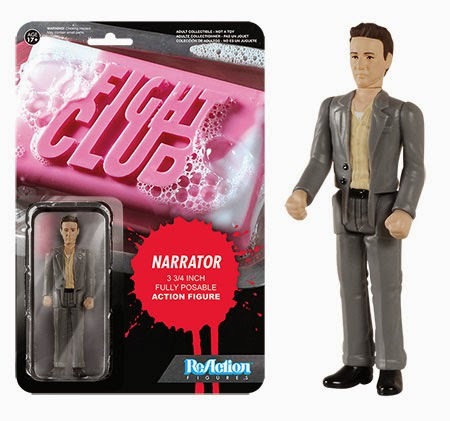 Tyler Durden even comes in a shirtless version in case you get any ideas! May 21, 2015 in Funko, Gremlins, Jaws, Press Release.